Suresh Gandhi is an Oracle Consultant & Blogger. He got vast experience in managing databases especially in Oracle in various domains like Education, Insurance, Banking & Telecom. 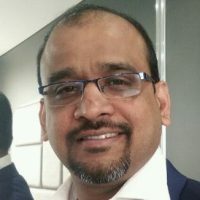 He is working with Qualcomm as Senior Manager and also Independent Director for Independent Australia Oracle User Group (AIOUG). He shares his learnings & knowledge in his blog (http://db.geeksinsight.com) and presented various topics in Sangam & OTN. Alongside Oracle Database knowledge, he added proficiency in BigData and NOSQL Databases. Datalake is new generation Datawarehouse with structured and unstructured or semi structured data. We have to evaluate various ingestion methods from OnPrem and Cloud data sources and how Oracle Cloud Data Integration Platform or Autonomous Data integration platform helps in achieving to build a Datalakes. This session covers overview and demo snippets of Oracle Sharding. In the release Oracle 12.2, the Oracle Sharding feature provides the capability of shared-nothing architecture with Leader node and shared nodes to distribute the data to nodes and scale up to 1000 shards and without compromising on high availability and relational database properties. I will be presenting this topic with detailed configuration and also provides a conceptual overview and benefits over NOSQL Database Sharding.